Low Calorie Weight Loss Indian Recipes. Many would agree that the most difficult aspect of weight-loss is dealing with the misconceptions! How does one filter the good advice from the bad, the practical suggestions from the impractical ones! Swimming headlong into the world of dieting without arming themselves with the right information, people often end up going overboard with their weight-loss measures. They strictly avoid their favourite dishes, go on crash diets, and end up spoiling their health and appetite in the long run! 1. Adopt healthy lifestyle practices, and cook and eat smart. 2. Eat coloured fruits and vegetables. They are loaded with Antioxidants and loads of disease fighting properties. 3. Exercise daily. That is a must. You must try and pick up a sport you love or try and exercise with friends. Yes, use the Gym also even if you are 70 years old. 4. Modify the recipes by replacing the high-calorie ingredients with low-calorie ones! Note if you are fit and lean, then you can have healthy high fat food. It will keep you feeling fuller and satisfied for a longer time. So you can opt for full fat paneer or curd. 5. Do not completely abstain from oils, dairy products etc. will lead to various deficiencies and diseases in the long run. Instead choose it wisely. Opt for olive oil as much as possible as it is good in Omega 3 fatty acids and choose Paneer over cheese always. 6. Eat small frequent meals every 2 to 3 hours. That’s a must. If you are working keeps some healthy snacks by your side or carry them if you are out of the house for a long time. 7. Try and get some Protein, Fat, and Complex Carbs in all your meals. For Vegetarians, have your dal, paneer, and curd to top of your protein. 8. Homemade food is the best and the healthiest. Cook your food and you know what you are putting into it. Avoid deep frying your food and stay away from packaged food which will solve 80% of your problems. Importantly, cut sugar consumption as it causes immediately inflammation in your body which can last for 4 to 6 hours and stores as fat immediately. Watch out for soft drinks, candy, chocolates etc. To guide you through your weight loss journey for a low cal lunch you could try some low cal parathas, dals, rice and raitas. Then some healthy low cal snacks for evening and Dinner can be low cal soups and subzis. End with some good low cal Sweets. This section includes newer and more innovative recipes. It has variants of traditional dishes as well as new ones, covering the whole gamut of the meal spread, ranging from soups and snacks to desserts. Just back from shopping and do not have enough time to cook? But if you’re on a weight loss diet, it’s not a good call to order from outside. This section on quick low calorie recipes will solve your problem. Here we have recipes that can be made in minutes and are very less tiring. If you’re craving for some spicy dinner then you can make this Matki Sabzi or this tangy Peru ki Subzi which is sure to satisfy your hunger cravings. When we think about snacks we always visualize something that is deep fried or loaded with potatoes. Check out our section on Low Cal Snacks that are fit to be consumed by people on a weight loss diet. Recipes like Chola Dal Panki where chola dal is used instead of rice flour making it much healthier than the traditional panki. Did you know you could use oats for making tikkis? Just combine oats with some vegetables and you are good to go. Cauliflower and Oats Tikki is a perfect example of a nutritious tikki that is loaded with cauliflower, carrots and french beans. Low calorie sweets and desserts may sound strange. But yes it’s true that we can make low calorie sweets and healthy desserts too. Something like Makhane ki Kheer and Chocolate Sandesh are prepared using low fat milk and sugar substitute to make it protein and calcium rich and low in calories but definitely not low on taste. Rice kheer is usually prepared during special occasion but if you’re on a diet then you should definitely try our recipe for Bulgur Wheat Kheer, high-fibre bulgur wheat with low fat milk and minimal sugar turns out to be heart and waistline friendly. Plan your balanced meals from these recipes, which are 'smart' rather than just low-cal, and enjoy good health! Stay fit, stay slim! Wish you a happy and healthy cooking experience. 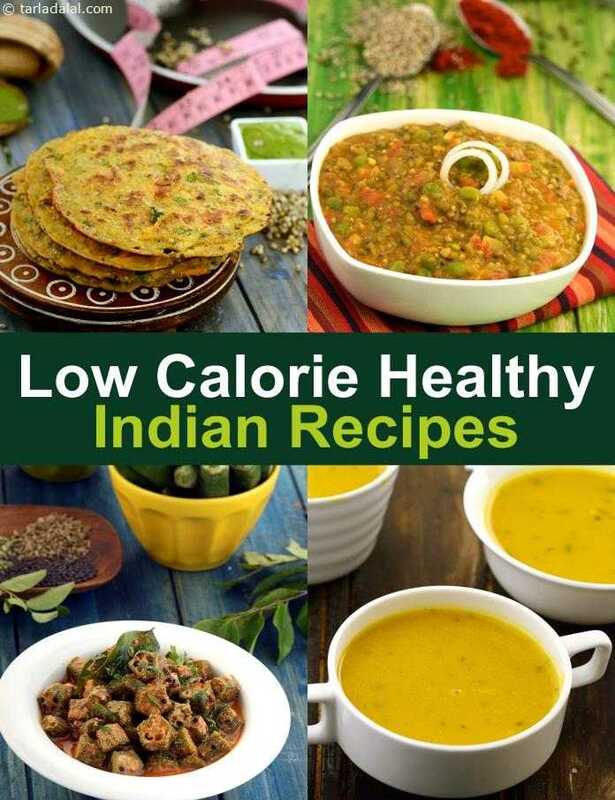 Enjoy our Low Calorie Weight Loss Indian Recipes and other low calorie recipe articles below.